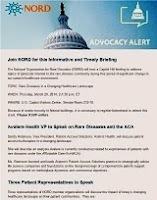 The National Organization for Rare Disorders (NORD) will host a Capitol Hill briefing to address topics of particular interest to the rare disease community during this period of significant change in our nation's healthcare environment. Volunteers to represent MEBO are requested. If you are interested in attending and are near Capitol Hill, please email me at maria.delatorre@meboresearch.org, and I will register you in advance. Due to onsite security in federal buildings, it is necessary to register beforehand to attend this event. Please let me know if you are interested in attending so that I can RSVP online with NORD.